Not every lottery winner spends their money on fancy cars and houses. Many would consider chef Roberto Mendoza a lucky man. But after winning a six-figure lottery prize, he will now be paying his good fortune forward. The chef, who was born in El Salvador, has cooked for former presidents Barack Obama, Bill Clinton, George Bush and international royalty. More recently, he even cooked for President Donald Trump. During his time as a chef at The Beverly Hills Hotel in Los Angeles, he catered the Academy Awards and often hosted parties attended by A-list celebrities. After moving to Charlotte, North Carolina, Mendoza continued his culinary expertise as an executive chef, ran his own restaurant for a time and now works for Sysco Foods Service. Despite his many accolades, Mendoza told TODAY Food he's never actually won anything before. But during his mother's recent visit to the U.S. from Guatemala, she told her son that she had a "lucky feeling" and predicted Mendoza would win the lottery. 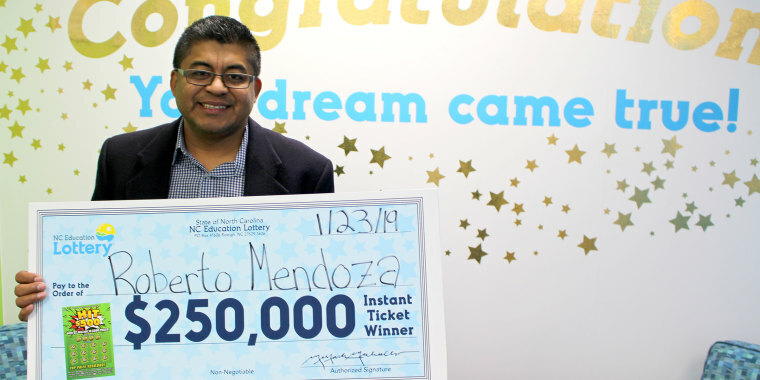 Not usually a gambler, Mendoza went to a local 7-Eleven and purchased a $5 Hit $500 scratch-off ticket. He began scratching and saw the numbers reveal that he'd struck the highest possible prize for the game: $250,000. The North Carolina Education lottery said there are only six of these top prizes total, five of which have been claimed. Despite his success today, Mendoza's life has been filled with difficult circumstances. When he was a teenager living in El Salvador during the war in the 1980s, food was hard to come by. "I know what it's like to be hungry. When I was 14 or 15 years old, I went to bed without eating anything all day. I said to myself, at least [I have a] glass of water I'm going to drink," Mendoza told TODAY. "When I went to the faucet, just air came out. They shut the water off in my country. I went to bed crying and said when I grow up I'd do everything I can to make sure no one else has to go hungry." A few years after that night, Mendoza was kidnapped for two months. The Salvation Army found him and sent him to Canada for safety. From Canada, he went to California where he learned English and Hebrew (he was already fluent in Spanish and French) and decided to go to school for culinary arts. After building his experience over the years, Mendoza was finally in a place where he could help others, and decided to fulfill a promise he made to himself many years ago. Today, Mendoza cooks for the homeless in Charlotte, North Carolina, every Saturday. In 2014, he even started his own program, The Chef Heaven's Kitchen, to help raise money and donations for a village in the Dominican Republic, which he visits frequently. "What is in my heart, is cooking for the homeless," Mendoza told TODAY. "This last December, I bring toys, clothes, shoes and cook for the little ones. This is a very poor village where sometimes they eat and sometimes they don't." Three years ago, Mendoza bought property in the village and began building a cafeteria that will be used as a clean, safe place for homeless and needy villagers — especially local children — to get a meal. After winning the lottery, he knew exactly what he'd be doing with the money — and it doesn't involve a fancy car or luxury vacation. With his lottery winnings, ($176,876 after taxes) he will be able to complete most of the work on the facility, while continuing to serve meals to locals, though he estimates he will need additional funding before he'll be able to open the cafeteria permanently. Said Mendoza, "God and myself, we will do it together."